BRUISES: Why So Many Colors? Those who are rowdy or simply clumsy will have thousands of bruises in their lifetime. Have you ever noticed and wondered why bruises go through a rainbow of color changes before they completely heal? Why the colors of black, red, purple, green, yellow, and blue? When you bang yourself hard enough to break capillaries (the little blood vessels everywhere in our body), the release of blood leaks outside the capillaries, thus starting the progress of a colorful bruise under your skin. When we don’t break the skin, a bruise forms. The intensity of the color depends on how close the bruise is located to the skin. The changes in colors represent different stages of the healing process, which can take anywhere from a few days to a few weeks and largely depends on the size of the bruise. To learn what the different colors mean and the scientific healing process of a bruise, watch the video below. Accidents are inevitable, but here are a few tips on how to limit the extent and amount of time of the bruise. As soon as the injury happens, apply an ice pack to stop the bleeding that will lead to a bruise. Keep the area elevated above the heart to reduce bleeding and limit the swelling. After 48 hours (two days) apply heat several times a day. Heat increases circulation in the area and helps the colors fade faster. 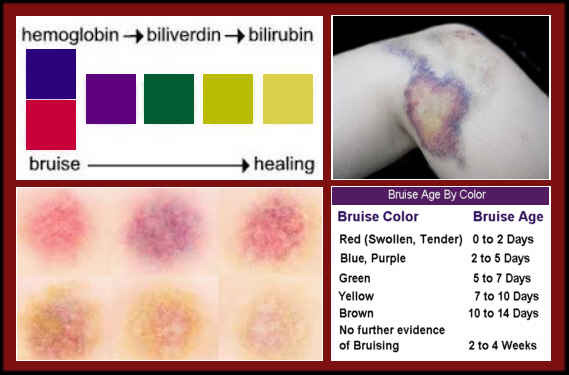 Learn more why bruises are so colorful and why the healing process takes so long. Reader – Would you rather focus on breast health and ways to prevent breast cancer at the cellular level, rather than put the emphasis on testing and retesting until you finally do find something to poke, prod, cut out, or radiate? (H/T) Why Do Bruises Change Color?